The second and final revived Bungay Fair. A third would probably have been a success too far. The combination - travellers and showmen, the Barsham 'hippie types', the locals, that was an energetic brew. There were stress lines galore for the fair makers to juggle as never before. Then you had the layout. With a race track in the centre of the field the normal structure was impossible. The varied centres of activity and the movement of people betwixt and between them, that allowed for multiple possibilities. The flow round the outside of the racetrack reduced those possibilities and stretched the site out enormously. Meanwhile, the emotional stresses mythologised by Neal Oram, towards the end of The Warp, were happening near the centre of the organisational scene. It was all quite strange. 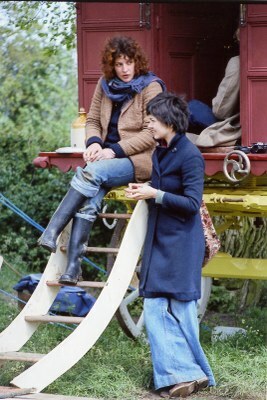 As the committee had determined that the ‘77 Horse Fair should be financially independent (from Barsham or the East Anglian Arts Trust) a lot of time was spent and fun had at the many fund-raising events that took place before the Fair. Andy Bell arranged a whole array of dances and concerts – often featuring Hank Wangford and another local band, Cousin David – each of which was a gem. Volunteers from the committee manned the doors, ran the bars and the rest of us made sure we turned up in support. Tony Harvey did a tremendous job running film shows (Eye White Lion) and driving events and lots of people made individual donations. Someone (probably Keith Payne) had the bright idea of running a 50/50 auction in Bungay which took place on Saturday 2nd April. This was very successful but a nightmare to organise. Stuff had to collected and stored, prices negotiated with donors, scrupulous records kept and afterwards receipts and payments sent out (often pence) for half the realised price. I still have copies of some of these receipts and also a hair drier that I bought at the sale and still use! Mr Payne (senior) and Mrs Payne ran the auction and worked tirelessly all day to make it the success that it was. Having secured the site at Mettingham for three weeks the site crew moved in and began preparing for the Fair. Building the Race Track was central to the event and strict rules set down by the British Harness Racing Club had to be adhered to. If we didn’t comply we wouldn’t be licensed and we wouldn’t be able to run any harness racing. Much scaffolding was used to create a race track a quarter of a mile long and 60’ wide which just about ‘complied’. On the day, much of the H&S regulations (which didn’t really exist then) went out of the window as one of the travellers emptied a horse box into the centre of the track and so we had a small herd of horses galloping madly around all the while the races were running. It also meant that the plan we had of tethering all the auction horses to the inside of the track had to be abandoned because we couldn’t risk mixing the public with loose animals. It was just one example of how hard it was to accommodate the travellers despite the fact that they were the target audience and the whole thing was being put on really for their enjoyment. I remember jumping up and down and hugging Keith with excitement when the first dealer’s horse boxes and traveller’s caravans started pulling onto the field, but in the end they really were the reason why the Horse Fair never happened again. They trashed everything and really annoyed everybody living in the locality. Mr Dennis, owner of the site mentions in his refusal to allow a 3rd Fair that ‘he had to take into account the feelings of others not least of all those responsible for the welfare of farm livestock’. Heaven knows what was happening off site – sheep rustling perhaps? - what was happening on site was bad enough! When the day dawned of the Jubilee Procession through Bungay, we all turned up at John Utting’s Farm at 11am. The maypole had been taken down and moved to JU’s to be decorated. It looked fabulous and was then moved to the Maltings to take it’s place at the head of the procession. We had to borrow some horses (from Mr Edwards) to pull the maypole and his wagon through the Town - we couldn’t use John Utting’s animals as they were all in foal that year. I was riding in Keith’s wagon and when he realised that his horse wasn’t going to make it up the hill in Broad Street to the Buttercross we all had to get out and push! With plenty of exhortations to ‘push harder’ from Keith we made it to the top and I couldn’t believe my eyes and ears when we got there.Lionel Glennie had filled a wagon with cut daffodils and they were being given away to the crowd as we went past. June Glennie’s girls were maypole dancing in the Market Square – there were all sorts of people dressed in colourful costumes, musicians, crowds of people, lots of applause… it was a fantastic start to the Fair, unforgettable really. The maypole arrived back at the site and placed upright again with ceremony, reverence and respect. It was an inspiration every time you walked past it and a marvellous object in it’s own right. Keith had asked me to secure the services of some council workmen who were doing some roadworks nearbye. I persuaded them to bring their roller onto the site to flatten the race course. Someone else secured some metal tracking to lay over the mud in the car parks – this cost several people their exhaust systems as they drove from one section to another and the ends flicked up. Peter Warbey and I set off on day 2 to tackle the ladies loos with axe handles and rubber gloves to the fore. Collecting money from the gates and carrying it across the site to John Agnew’s caravan where he and other Green Deserts helpers were sitting in a fog of the sort of smoke not generated by tobacco, counting the takings. There must have been a lot of coin handed in with an admission charge of 40p per adult, kids and OAP’s 20p. Even then there were a few unpleasant encounters with some travellers who didn’t want to pay and just pushed their way in. There were horses everywhere, wagons, turn-outs and piles of harness. Keith had been comissioned by one of the travellers to make the most amazing trolley covered in carvings and gold leaf. It was being driven around the site by a high stepping palomino pony. I heard afterwards that despite looking great the axle subsequently broke as it had been weakened by over carving. I would love to know where it is now. It was fantastic to see the travelling people handling the horses. Ben Loftus took the plunge and bought one at the Auction only to find it was virtually un-driveable afterwards. It was a mare, in foal and Nigel Towse, my partner, bought the foal (Harry) from Ben and broke it to harness. The Fair was the start of 15 years of driving horses for me. I fell in love with the whole thing and bought my first turn-out from Freddie Hambling, then going on to join Tony Harvey on the regular driving events he organised to local pubs. There would sometimes be as many as 22 turn-outs trotting down the roads on a Sunday. I watched the horse races with my heart in my mouth! People were out to win and the atmosphere was electric as turn-outs shot round the track wheel to wheel sometimes. Roger Sharman triumphed! What a combination and there for everyone to enjoy. Many accolades have been voiced about Keith Payne for the events that he staged during the 1970’s, but this was one of his best in my opinion. When he resigned later in the year (he was pretty pissed off with the mayhem the travellers had caused too) an attempt was made to keep the Horse Fair going for a 3rd year but really without someone like him to spearhead it all, it was never going to happen again. "NOW HERE'S an interesting one. Cherry Spottiswood of Buxton has written to say (Omigod, Cherry! ): "Each and every night I lie sleepless and tormented in my lonely bed, your photograph and a lock of your hair clasped tightly between ...' - well perhaps we'd better skip that bit (although I'd be grateful for the lock of hair back). Let's see - "Can you tell me, you vision, you Adonis, whatever became of the so-called 'Beautiful People' of the late 1960's and early 1970's?" "Yes Cherry, I believe I can. I was, all joshing aside, always slightly intimidated by the Beautiful People. For a start, I suspected that I was rather too fat to qualify as a Beautiful Person myself, and I always looked like fairground facsimile of an Eastern potentate when I dresses in velvet and festooned myself with beads. Spiritually I was right there with them though. I longed to travel to Ranjipore (or wherever it was they all travelled to) and lie for weeks on rich carpets and amid Nepalese cushions get smashed out of my mind. Unfortunately I had to earn a living instead. I also hoped that when the time came I would have the nerve to call our offspring Canute or Iphgenia or "Second Thoughts" or Tolkien or Hiawatha. At the same time I had a mental picture of the luckless little brute having to announce himself on his first day at school, and my resolve melted away and he turned out is be called William Instead. I think he will be grateful for that. I had assumed that the Beautiful People had been absorbed into society, had become accountants and mothers-of-two, provincial art masters and dentists receptionists. But I discovered only yesterday that they have survived - and as Beautiful People too - in remote rural areas. 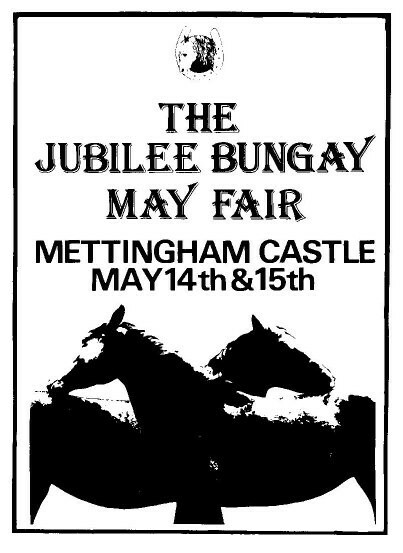 With a gang of village layabouts and our district minibus I crossed down (or up) to a charming spot called Mettingham Castle, a tumbledown er ... castle in the badlands of the Norfolk - Suffolk border for the Bungay Jubilee May Horse Fair. And there the buggers were. Hundreds of em. A veritable sea of velvet. Those from the wealthier homes were on horseback, shouting interesting and instructive things between one another for the benefit of passers-by, bumping their meddlesome nags into the grateful peasantry; while their fortunate brethren sold us hideous leather goods, monstrously ugly works-of-art and scruffy dresses. I had never noticed before how essentially middle class these radiant folk are, either. In the most sublimely cultured tones they explained that, no, there were no toilets, called for their children (these latter mainly blessed with Arthurian names, dressed in gypsy-chic and deserving a sharp boot in the arse) and trying to persuade potential customers of the physical and moral benefits of drinking coffee made from hedge clippings. They sat around fires, alongside beautiful Romany caravans, strummed out of tune guitars, and tapped incessantly on "hand crafted" "Indian drums", with a sharp disregard for tempo which was doubtless the result of remarkable inner cleanliness. The Pig, bless her, who, since a whole catalogue of unfavourable experiences with Beautiful Persons around the turn of the decade, has little time for the university trained peasant surrogate, grew very restless very quickly; an hour later we were back on the road in search of more Plebeian amusements. I hope that answers your question, Cherry."